It's not often there's a brand new vegetable to grow in our gardens, but breeders in the U.K. have come up with an unusual new green. Kalettes™ are a cross between kale and Brussels sprouts. Why would anyone want to do that, you ask? Well, it seems someone didn't think kale had enough versatility in the kitchen. You may not agree, but you are probably intrigued. Kalettes are a hybrid vegetable developed through the traditional cross-pollination of kale and Brussels sprouts. They are not GMOs. Both kale and Brussels sprouts are of the species Brassica oleracea (along with broccoli, cabbage, and cauliflower). Kalettes were developed by the British seed house Tozer Seeds. They have been around for a while in the U.K., where they're known as Flower Sprouts®. The plants are long season, at least 110 days, just like Brussels sprouts. They also get as large as a Brussels sprouts plant. But instead of tight buds that look like mini-cabbages, Kalettes produce leafy "flowers" that look like mini heads of kale. Staying true to their initial intent, Kalette is said to be quite versatile in the kitchen. They can be enjoyed raw or cooked any number of ways, such as roasted, grilled, stir-fried, or sauteed. If you like cooking greens, they sound like a welcome addition to the garden. 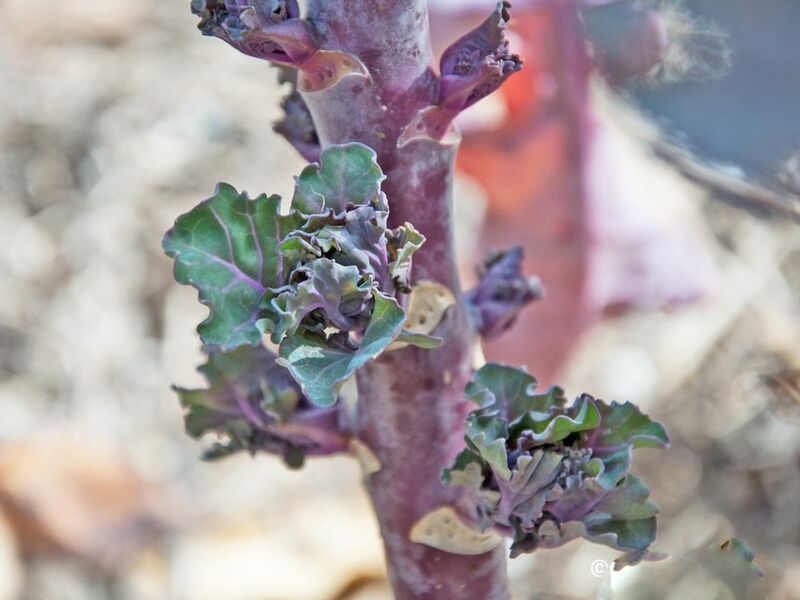 These odd little Flower Sprouts® grow well enough, but they take forever to start forming buds. You will definitely need patience. You will also need to give up real estate in the vegetable garden because they need to be planted early if they are ever going to mature. Unlike kale, which is ready to harvest by mid-summer at the latest and it keeps on going well past frost, Kalettes don't start producing until mid-Fall, in most growing seasons. 'Autumn Star', is supposed to be the earliest to mature. The photo on this page was taken on November 1st and many of the flower buds still had not opened. The other drawback with Kalettes is the price. Because this is a new novelty vegetable, even the seeds are expensive -- $6.95 per packet of 25 seeds. That could be because they haven't built up a large inventory of seed or if it's just because of exclusive marketing. Either way, it's a lot for an untested vegetable. However, they are a beautiful plant. The flavor leaned more toward Brussels sprouts than kale but being fond of both, that was okay with me. You might not want to grow them every season, but they are definitely worth a try. Where Can You Get Kalette Seed? Johnny's Select Seed is currently the sole U.S. distributor of Kalette seed. They are generally considered an excellent company with very good support. They offer 3 different varieties of Kalette seed which mature at different rates, so you can extend your Kalette season. However, calling 110 days to maturity "early season" is a bit misleading. In this case, the season is fall -- early, mid, and late fall. 'Autumn Star' is the early season variety, at 110 days to maturity. 'Mistletoe' comes in at 124 days to maturity and is considered mid-season. Rounding out the year is late season 'Snow Drop' at 138 days to maturity. By contrast, Brussels sprouts mature in about 90 - 110 days. Kalettes handle a little frost very well, but even so, gardeners with shorter seasons would be wise to stick with 'Autumn Star". If you want to experiment, you can buy seeds of all 3 in the Kalettes Collection, for $16.65. Kalette's have been slow to become available in grocery stores, but you can look for them in the packaged vegetable section of the produce aisle. How Do You Grow Eggplant? How Do I Grow More Vegetables in Less Space?